Speak up for Walking and Biking in Seattle’s 2018 City Budget! We care about making every neighborhood in Seattle a great place to walk, bike, and live, but too many important projects are being delayed or watered down. 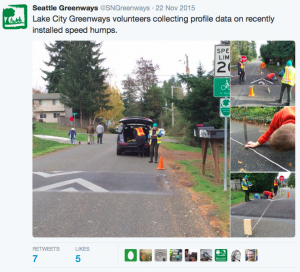 That’s why Seattle Neighborhood Greenways is leading the charge as part of a new transportation alliance Move All Seattle Sustainably (MASS). 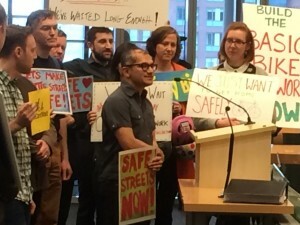 We’re calling on the Mayor and City Council to go beyond general statements of support for transportation and environmental issues, and act now to align our city budget with Seattle’s values. Safer Intersections. Halt spending on adaptive signals, which prioritize cars over everyone else, until the technology can prioritize people walking and biking. Traffic Calming. 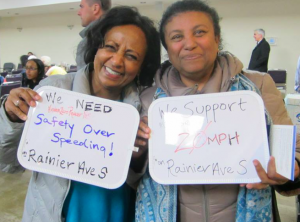 Fund a Home Zone pilot project, using diverters and traffic calming to limit and slow traffic on residential streets, particularly in areas with no sidewalks. Basic Bike Network. Add additional funding to get people to and from the new Arena and into and through Uptown and South Lake Union. Equitable Street Parks. Restore funding to successful Pavement to Parks projects with an equity focus. Act now to ask City Council to support these priorities, and join us on Wednesday, October 24 at 2:00 pm at the Transportation Committee Budget Hearing. Public comment is at the end of the meeting, likely around 4:00 pm. 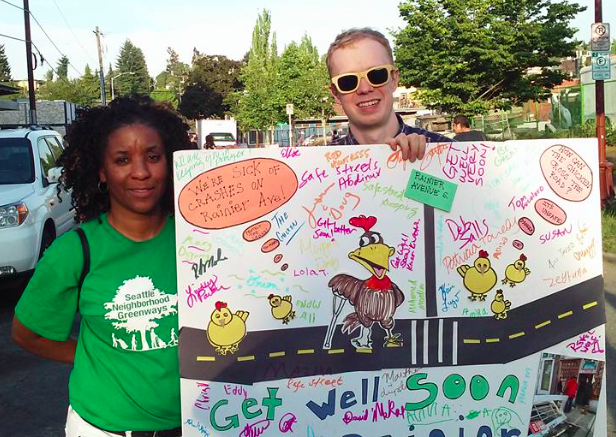 Get involved in Seattle Neighborhood Greenways by volunteering with us or donating to support our work. 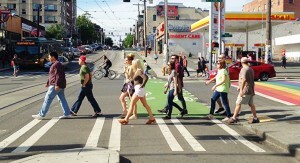 Every life is precious, and over the course of a year, thousands of lives in Seattle are impacted by traffic violence. 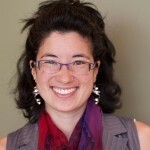 In just the past few months in Seattle, two young parents were hit and killed by people driving, people young and old were maimed for life crossing the street, and people commuting to work who’d love to get healthy exercise by walking or biking to their jobs were intimidated by speeding and distracted drivers and so refused to continue commuting by active transportation. As a society, we’ve chosen to accept this loss of life and freedom as our collective cost of driving. Serious road injuries and fatalities also have a real economic cost. A shockingly high cost it turns out. The high cost of traffic violence is what we asked Tim Ganter to capture in his extraordinary data visualizations. Let’s look at one example, the intersection of Rainier Ave S with MLK Ave S, better known as the Accessible Mt. Baker project. In 2016, our advocacy group successfully lobbied for more funding to go to this intersection. Tim’s new map tells the story of what our local advocates had verified on the ground. 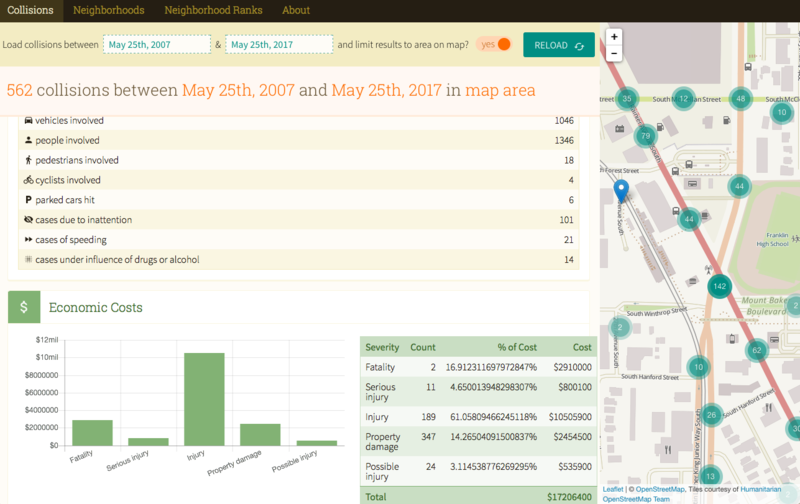 In the past decade there have been two fatalities and scores of injuries in and around MLK and Rainier Ave S.
In the past decade, the cost of traffic violence around MLK and Rainier Ave S added up to an astonishing $17,206,400 according to actuarial tables developed by the National Safety Council. So which fact is more shocking? The money or the violence? Which fact is most likely to influence public opinion and get leaders to invest and take action? 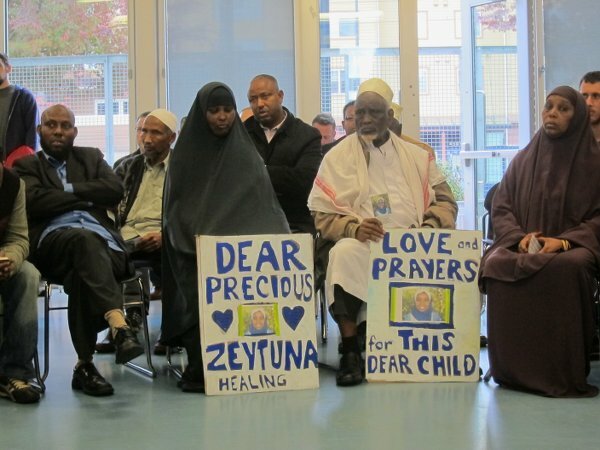 Stories of individual lives lost and shattered because of traffic violence are compelling. 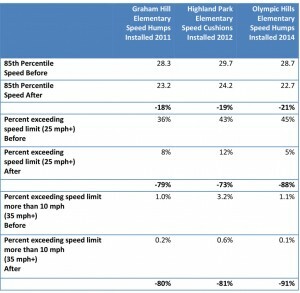 But so too are the dollar costs to our society for choosing to invest in streets that favor safety over speeding. I encourage you to explore Tim’s work, based on Seattle’s open-sourced traffic incident reports, combined with fully vetted National Safety Council cost estimates for fatalities and injuries. 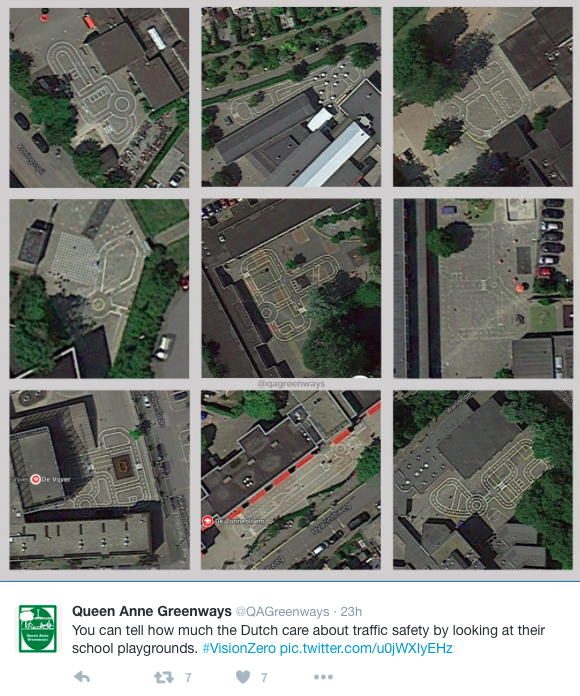 Please let Tim and @SNGreenways know how you use this work in your own neighborhoods. And let Tim know if you want his expertise in developing traffic data visualizations for your own community. 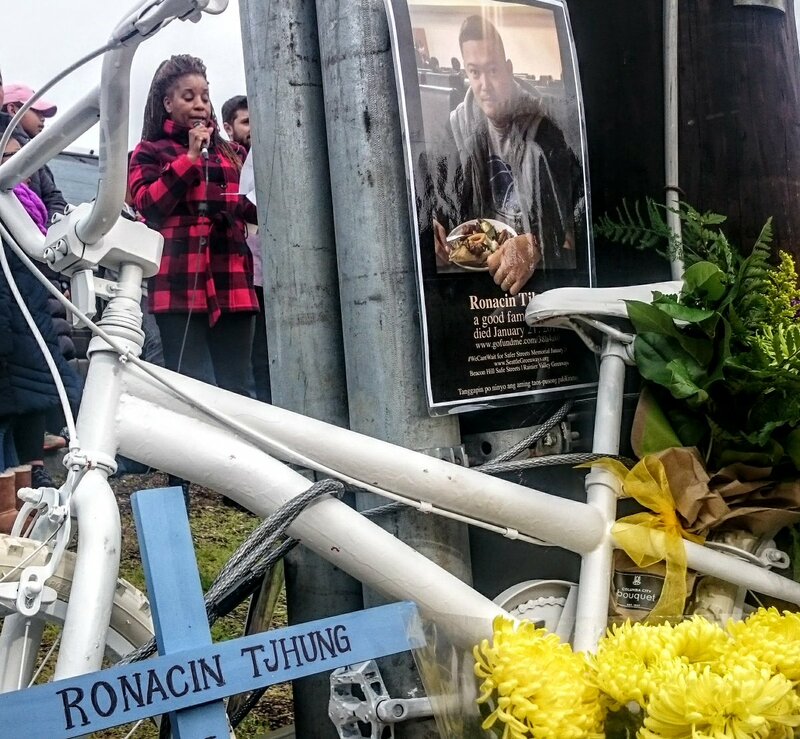 For weeks now, a poorly managed building site and less than stellar City oversight has forced Roosevelt High School children to walk in traffic — just a few feet away from last year’s DUI death of Andres Hulslander. Seattle’s Transformation Department fixed the problem using entirely upcycled, leftover, and on-site materials to create a five-foot walkway and 11-foot driving lane. People drive slower past the walkway, and starting Monday morning, our children now have a protected space to run for the bus. Rainier Avenue South was the most dangerous street in Seattle, tearing apart many families, keeping people from walking in their neighborhood to visit friends, families, schools, and businesses. It was a hazardous barrier, physically dividing the Rainier Valley community. 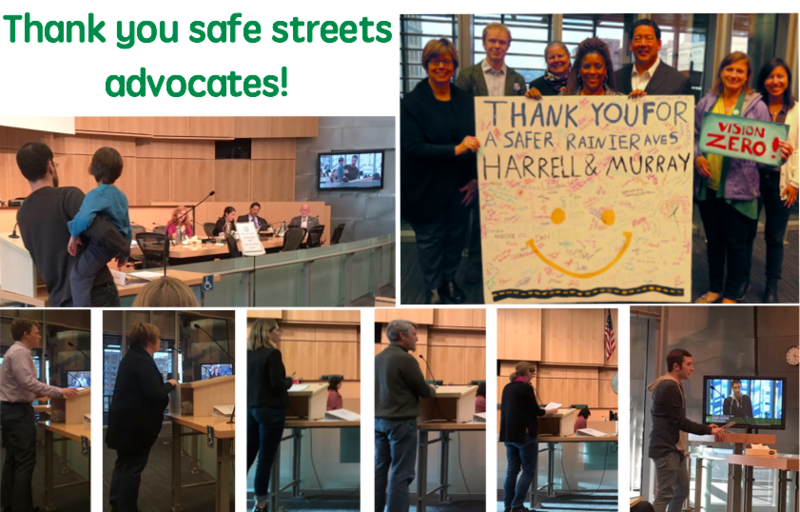 With one crash every day causing 630 injuries and two fatalities in the last three years, the need was clear, but fear of community pushback kept the politicians and the Seattle Department of Transportation (SDOT) from acting boldly. 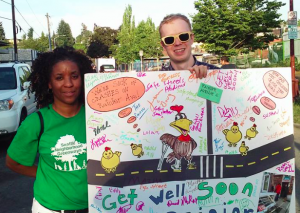 Seattle Neighborhood Greenways provided the expertise to help Rainier Valley Greenways build a powerful campaign to make bold change not only possible, but inevitable.